Cats are naturally curious animals and can easily become discontent if unable to satisfy their natural tendencies. Unfortunately, this often results in an ambitious cat playing with dangerous or fragile household items. 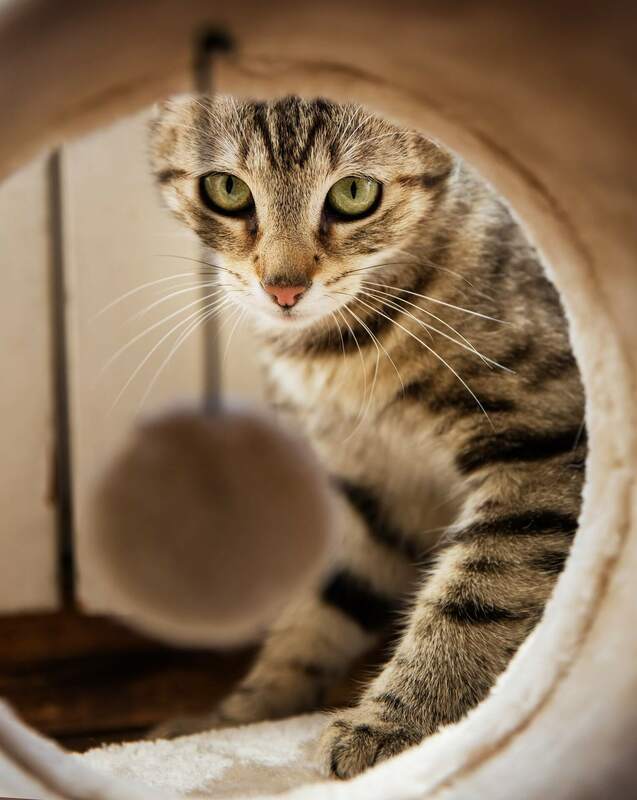 Creating a space for your cat to play can help entertain your cat in a safe and dedicated area. Any play spaces for cats should be “cat proof” and should not be able to be accessed by other animals in the house. In addition, the area should have all of the necessary toys and structures to entertain your cat. Ensuring your cat won’t hurt themselves while in their play space is of utmost importance. Loose wires should be kept out of reach of cats to avoid any possibility of a cat chewing on them. Chemicals and cleaning supplies should be kept in a different room, and plastic bags or other choking hazards should be removed. The play area should be safe from dogs and should have multiple hiding places. If you have several cats, ensure you have enough activity areas for all of them. There are endless possibilities for what you can create for your cat, but there are some key elements that any good play area should have. Cats are natural hunters, however, most house cats are rarely afforded the opportunity to hunt. Hunting is the primary source of mental stimulation and exercise for felines. Luckily, hunting can be simulated in the home through a variety of toys. Toys that have movement or lights and noise can be particularly preferable for some cats. Another important part of your cat’s play area is locations to climb and scratch. In nature, cats scratch to sharpen their claws and mark territory. Although they are hunters, they can also sometimes be prey, and tend to feel safer in high and hard to reach locations. Ensure your cat also has many hiding areas, some of which are on the ground and others that are located on perches. Cat houses can be used to create a second level hiding spot while providing an area for your cat to scratch. If the lay out of the room allows it, consider adding a window perch for your feline friend as well. Many cats enjoy watching birds and nature. This can keep your cat from boredom while inside. When you have finished creating your cat’s play area, your cat may not initially be interested in the new addition. Over time, your cat will become curious and explore their new surroundings. To help motivate them, catnip can be spread in the new room and additional attention could be given to the cat while in the room. Cats have significant need for stimulation and entertainment. Creating a play area for your cat will help satisfy this need.